Daniel and I went to visit my parents for a few days over Thanksgiving. As we were to be gone for almost 6 days, we had to put out lots of hay for the boys. We did not take off the hay string to keep the bales together for as long as possible. 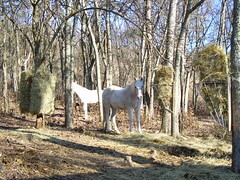 We tied the hay string to the trees to keep the horses from inadvertently eating the hay string. This method works quite well. When we returned on Sunday, the horses still had a bale left to eat. We usually keep them off the grassy pasture during the winter, but had allowed them to go into the grass while we were gone to make sure they had plenty to keep them busy and content.